Scientists believe big brown bats, Eptesicus fuscus, rely on the Earth's magnetic field to keep their bearings as they swoop the night sky. The team, writing in Nature, said the finding added to "the impressive array" of sensory abilities that the creatures use to steer in the dark. Over short ranges, bats orient by bouncing sound waves from objects. This process, called echolocation, helps them to locate prey and dodge obstacles. However, it is less useful over longer distances, and researchers have been unsure how bats navigate their way home after a night of hunting. Creatures such as homing pigeons, migratory birds, newts and turtles reply on magnetic fields for orientation. To investigate whether this was the case for bats, the researchers turned to the big brown bat - a species found throughout most of the US and Canada. Bats captured in a barn were exposed at dusk to an artificial magnetic field pointing east or west relative to the Earth's magnetic North, while other captured bats were left unexposed. The bats were equipped with radio transmitters, then transported 20km (12 miles) north of their roost and released. The team tracked them using a small aircraft. "The control bats, relying on their natural magnetic field, headed south, directly towards home," said Richard Holland, a visiting Marie Curie Research fellow at Princeton University and an author on the study. But those exposed to the artificial fields flew in the wrong direction. Dr Holland told the BBC News website: "When we released the other bats, after about five to 10km (3-6) we found those exposed to the east field flew east and those exposed to the west fields flew west. "This indicates they were using an internal magnetic compass, calibrated at sunset." Some of the bats, the team reported, reoriented themselves and shifted their direction to head for home. Dr Holland said this suggested the bats may have recognised their compasses were faulty and switched to some other mechanism, as yet unknown. 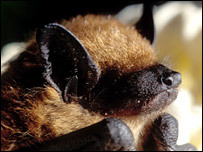 He added: "Given that it is possible to receive the signals of the transmitters used in our experiments from a low orbit satellite, it will hopefully soon be possible to track small animals, such as bats, birds and insects, globally with significant consequences for disease, agriculture and conservation." Merlin Tuttle, president of Bat Conservation International, said: "Probably 90% of the world's bats have barely been studied other than to give them their names - they rank as one of the least studied mammals. "It does not surprise me that they use magnetic fields, although I am sure further research will disclose many other additional ways that they can navigate."